Locking hardwood flooring is a fairly new type of engineered flooring. Engineered flooring first took off with laminates. It took into account ease of installation by fitting each plank with tongues and grooves. Although laminate flooring continues to get better, it tends to have a cheap feel, what with the use of fake veneer and particle board. Wood engineered flooring took care of this by using real wood veneer on top of plywood (which is, of course, a popular construction material of much higher quality than particle board). Related: Check out our selection of the best types of hardwood flooring, including comparisons and reviews! Next to come along is locking wood engineered flooring, which utilizes locking mechanism instead of tongues and grooves. This took away the need for glue during installation, not to mention the nails and staples of old. Nowadays, you can find locking hardwood floorings that are made of engineered or solid wood, although engineered wood is certainly more abundant thanks to its better economy. The common use of the term “hardwood” includes both solid wood and engineered wood. The best locking hardwood flooring does not necessarily have to be made of solid wood. Engineered wood flooring has become way more popular than solid wood, and not only because it is usually more affordable, but because the plywood base withstands moisture more effectively. That said, solid hardwood is still the gold standard, so if we’re going to talk about the best locking hardwood flooring, should it be of solid hardwood? Let’s see. One of the favorite best locking hardwood flooring of ours is the Base Décor EZ-Floor. It is made of solid teak wood, so there’s the outcome of the solid wood vs engineered wood debate. Each Bare Décor EZ-Floor plank is 12” in length and 1” in width. 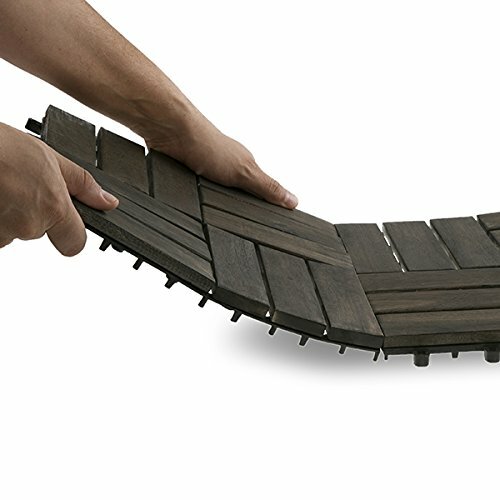 10 planks are attached to a tile outfitted with Bare Décor’s easy-snap interlocking system for connecting to other tiles. 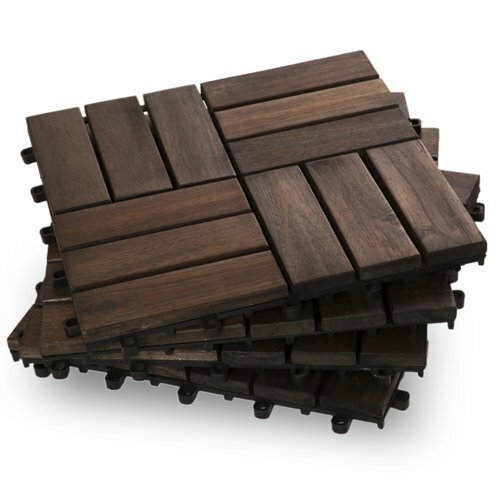 Each tile of 10 planks measures 1 square foot (12” x 12”). The thickness is 1.0625”. These tiles are available in sets of 10. In addition, the Bare Décor EZ-Floor end planks and corner planks are sold in sets of 2 or 8. The Bare Décor EZ-Floor is rather pricey because it is made of solid teak, but the overall cost is low since you can install this flooring yourself in a very straightforward DIY project. With just a good pair of eyes and a moderately steady pair of hands, you can skip paying for costly professional installation. Each solid teak plank is sealed and prefinished in oiled finish. The solid hardwood Bare Décor EZ-Floor can last more than a generation (replace the plastic tile bottom as necessary). Just sand and refinish if the wood becomes overly worn. Since the Bare Décor EZ-Floor is a floating installation, you can lay it on any flat surface. This would include bare cement floor, wooden subfloor, and even dirt and outdoor deck. It is rated for both indoor and outdoor installation. Lay a small area of Bare Décor EZ-Floor in the entrance and it would be like a grand oversized welcome mat. It works just as well in the shower and pool area as it does in the living room and bedrooms. Another awesome feature of the floating installation is that you can just pick it up and move it somewhere else. It lacks the permanent feel of traditionally installed hardwood floor. The locking connectors are plastic. For regular-duty residential use only. It will not stand up to industrial use or constant moving of heavy objects over the tiles. The Garden Winds DT02 comes in 3 finishes: mahogany, classic, and contemporary. Contemporary is darker than classic but not as dark as mahogany. Like the Bare Décor EZ-Floor above, this best locking hardwood flooring is also a floating installation of interlocking tiles. 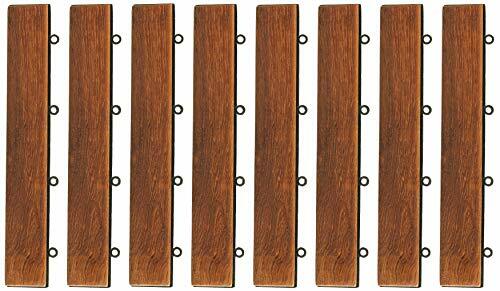 With the Garden Winds DT02, each tile holds 12 wood planks that are attached in groups of 3 in a parquet floor design. Each tile measures 11.8” x 11.8’, or essentially 1 square foot each. They are sold in sets of 10. 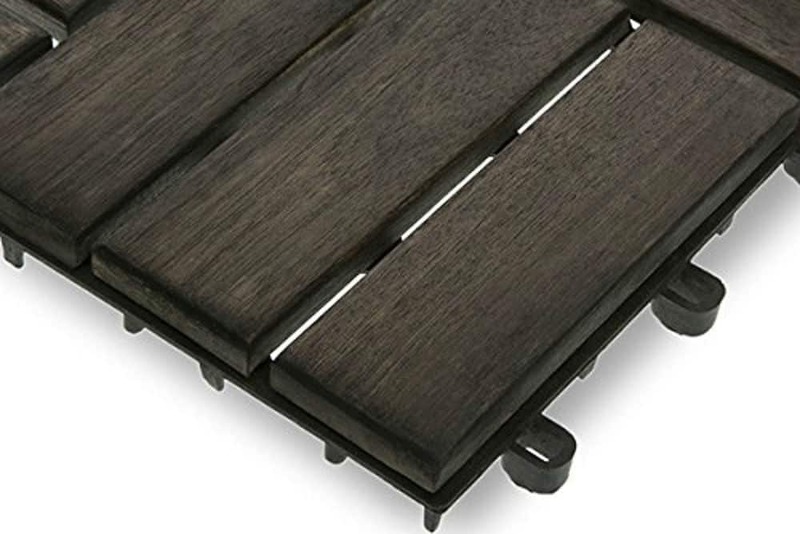 Although the Garden Winds DT02 can be used indoors or outdoors, it is more suitable for outdoor use since its finish is reminiscent of wooden outdoor decks. It is made of solid acacia hardwood and finished in real wood, yet the price is fair and affordable. This is our best locking hardwood flooring for the outdoors. We approached the Garden Winds DT02 cautiously since the manufacturer warned that it was not for high-traffic areas. What we discovered is that it is actually quite durable. The plastic tile base and connectors hold up way better than expected. The ground only has to be semi-flat. We installed a big slab of Garden Winds DT02 on the lawn and the result was spectacular. You can literally install it anywhere, and move it just as easily if you ever change your mind. The finish is more dull than shiny. 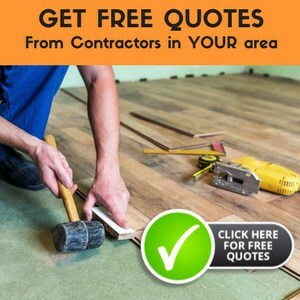 It should be obvious by now that we are partial to the best locking hardwood flooring that is also the easiest to install. There’s nothing easier than wood planks attached to interlocking tiles. Our other requirement is that the planks have to be made of solid hardwood. It’s as simple as that. In a nutshell, for indoor installation, the best locking hardwood flooring is the Bare Décor EZ-Floor. Its oiled solid teak planks are absolutely gorgeous. For outdoor use, you can’t go wrong with the Garden Winds DT02. It may surprise you to know that adding hardwood flooring to an outdoor area can have an even more dramatic effect than indoors. Give it a try, and we think you will agree.